Pteris Ferns have fine leathery foliage are relatively easy to grow in a well lit but shaded area. Pteris cretica is the Cretan Brake Fern or Table Fern. One of the most decorative species is Pteris cretica ‘Mayii’ or ‘Variegated Club Foot Fern’ has great paler green foliage with near white centres, easier to grow than many. 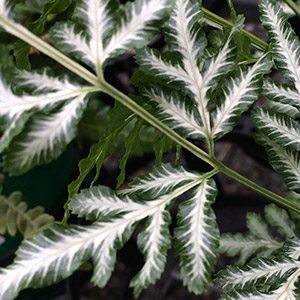 Another worth looking for is P. ensiformis Victoriae, a very decorative cultivar with silver veined green foliage, also known as the Variegated Brake Fern. Another with white centred foliage is Pteris cretica ‘Albolineata’. For cooler climates try Pteris tremula fern, Shaking Brake Fern or Tender Brake Fern this is from Australia and New Zealand and is a fast growing fern. Both Pteris tremula and Pteris umbosa grow well in the Royal Melbourne Botanical Gardens. A large genus they are mainly, but not all, from tropical and sub tropical areas. Great for indoor situations and do well in the ground in shaded moist positions. Filtered shade is best as Pteris Ferns do not like direct sun. Wishing Well Nursery in Silvan.